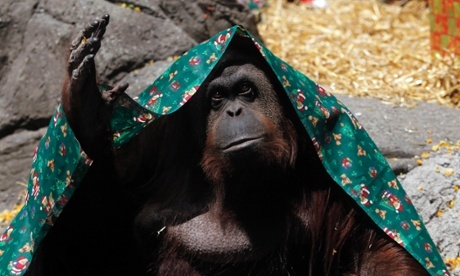 In a landmark court decision, an Argentine court has recognized that an orangutan unlawfully imprisoned in a Buenos Aires zoo is a “non-human person” and thus entitled to habeas corpus rights. Argentina has shown itself to be more enlightened than the United States in recognizing the principle that all members of the biological family Hominidae should enjoy basic hominid rights. An orangutan held in an Argentinian zoo can be freed and transferred to a sanctuary after a court recognized the ape as a “non-human person” unlawfully deprived of its freedom, local media reported on Sunday. The court agreed Sandra, born into captivity in Germany before being transferred to Argentina two decades ago, deserved the basic rights of a “non-human person”. A US court this month tossed out a similar bid for the freedom of Tommy the chimpanzee, privately owned in New York state, ruling the chimp was not a “person” entitled to the rights and protections afforded by habeas corpus. In 2011, the animal rights group People for the Ethical Treatment of Animals (Peta) filed a lawsuit against marine park operator Sea World, alleging five wild-captured orca whales were treated like slaves. A San Diego court dismissed the case. Orangutan is a word from the Malay and Indonesian languages that means “forest man”. “When you don’t know the biology of a species, to unjustifiably claim it suffers abuse, is stressed or depressed, is to make one of man’s most common mistakes, which is to humanize animal behaviour,” Sestelo said. This entry was posted in court rulings, orangutans, United States, Western hemisphere and tagged court rulings, orangutans, United States, Western hemisphere. Bookmark the permalink.